The ULTIMATE Argan Oil Vapor Flat Iron™ is an advanced, professional style appliance, famous for its great performance and reliability. The ULTIMATE Argan Oil Vapor Flat Iron™ features an innovative and restorative infusion vapor system for heat protective styling. The ULTIMATE Argan Oil Vapor Flat Iron™ transforms the Argan Oil Infusion Treatment™ solution into vapor which is then infused into the vented plates for intense structural conditioning as you glide the plates over hair. Additionally, Argan oil is infused in the ceramic plates to revitalize and strengthen your hair. Moroccan Argan Oil that is used in the Argan Oil Infusion Treatment™ helps to protect the hair up to 450°F heat. 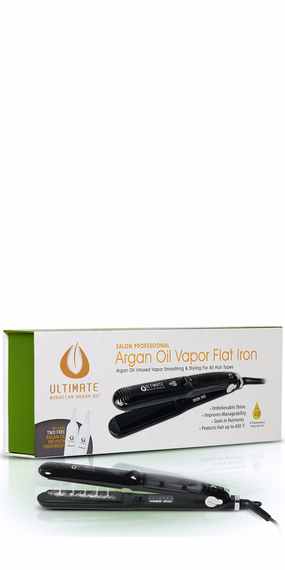 The ULTIMATE Argan Oil Vapor Flat Iron™ is affordable and easy to use. The ULTIMATE Argan Oil Vapor Flat Iron™ should be used in conjunction with the included ULTIMATE Argan Oil Infusion Treatment™, but may also be used without it as a regular flat iron. Before plugging the appliance into an electrical outlet, remove the tank by sliding the tank-lock switch toward the “UNLOCK” symbol. This will pop the tank loose from the iron. Turn the tank over and peel back the rubber cap on the bottom of the tank to open the refill. Insert the infusion treatment into the opening and reseal the rubber cap.